Rehabilitative care of the symptoms in patients with progressive multiple sclerosis can also be used for those with relapsing multiple sclerosis. There are several clinical profiles for progressive multiple sclerosis (MS), including cognitive decline; a spinal cord disorder with gait and bladder, bowel, and sexual impairments; a cerebellar syndrome; or a combination of these. Cognitive decline is the single most common cause of premature disability. Further, cognitive decline, fatigue, and depression are the most important symptoms that negatively affect quality of life for patients with MS.1,2 Rehabilitation strategies for patients with cognitive impairments or cerebellar disease are evolving.3 There are effective and useful strategies for symptoms associated with spinal cord involvement. For patients with progressive disease, whether it is primary (ie, progressive from the onset) or secondary (ie, preceded by a relapsing-remitting course), the focus of treatment is rehabilitation, because there is still limited ability to alter disease course for progressive MS. The only approved disease-modifying therapy for primary progressive disease, ocrelizumab, appears to be most effective for patients who have evidence of active inflammatory disease. As yet, there is no approved therapy for secondary progressive disease. Consequently, a clinician caring for a patient with progressive MS must be familiar with rehabilitative strategies. 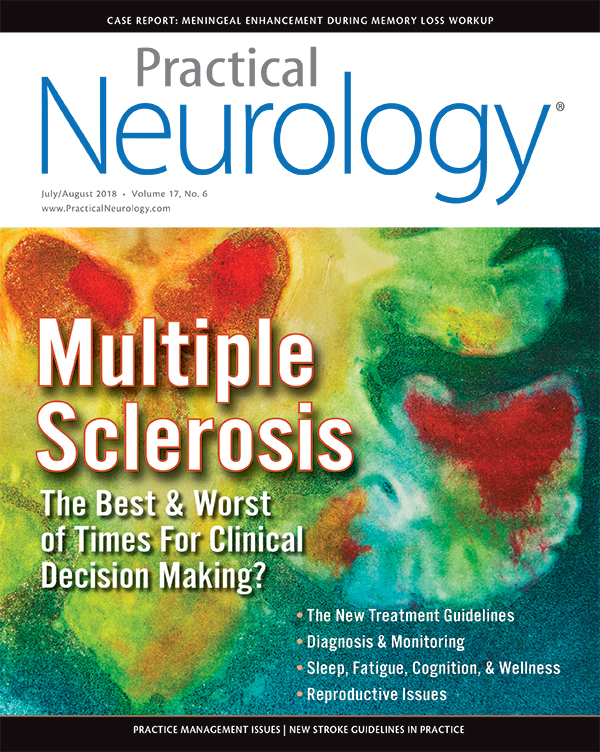 Although this article focuses on the comprehensive management of patients with progressive forms of MS, the management principles discussed apply to patients with relapsing-remitting MS for the same symptoms. The symptoms discussed include gait; bladder, bowel, and sexual dysfunctions; cognitive decline; speech and swallowing; and pressure sores. Gait can be altered by several cerebellar or sensory mechanisms including weakness, spasticity, ataxia, or, as is often the case, a combination of these. Spasticity is common in patients with MS and manifests in many ways including stiffness and heaviness of one or both limbs, cramping pain, spasms, and clumsiness. In the lower limbs, patients refer to dragging of one or both limbs, often after walking a specific distance and especially under conditions of high ambient temperature and humidity. Toe drag is a common complaint and a cause for falls. Inspection of the shoes will often reveal wear at the medial toe tip of the affected lower limb. Watching a limited sample of gait (eg, 25-foot timed gait) may not be reliable for assessing this symptom because it often does not appear until the patient has walked more than 25 feet. Patients should be routinely asked about how far they can walk before needing to rest and what specifically is the reason for needing the rest. Cramping and spasms are common and often painful in patients with spasticity. Spasms during the course of sleep are particularly problematic and frequently unnoticed by the patient because spasms may not be vigorous enough to cause full arousal. Unnoticed spasms may interfere with sleep quality and contribute to daytime fatigue. As in patients with other disorders that interfere with sleep hygiene (eg, sleep apnea), patients with nocturnal spasticity often awaken in the morning unrefreshed, as though they have not slept even though they confirm an adequate number of hours of sleep. Useful insight may be obtained by questioning any bed partner about whether or not spasms occur during the night. Patients also report spasms of their lower limbs when the lower limbs are touched (eg, while having a pedicure). Any patient who reports a sudden increase in lower limb symptoms including spasticity or weakness should be questioned about urinary symptoms because increased spasticity could represent the initial manifestation of a urinary tract infection (UTI) (pseudoexacerbation). Patients should also be asked about other potential causes for a sudden increase in spasticity including constipation, hemorrhoids, ingrown toenails, and skin lesions (eg, pressure sores). Effective treatments for spasticity include the oral agents: baclofen, tizanidine, and diazepam. It is essential to carefully explain to the patient that the treatment objectives are gait improvement and relief of spasms and spasticity-related pain. Unless it is contributing to the symptoms, a velocity-dependent increase in tone does not require treatment. Start baclofen at a low dose (eg, 5 mg 3 times/day) and titrate to an effective dose by adding 5 mg per dose every 3 to 5 days to allow adequate time for assessing response. Baclofen can be taken with meals if nausea, an uncommon side effect, occurs. Patients must understand that their response is what determines the optimal dose, which varies and may be relatively high (eg, >100 mg/day) but could also be minimal. As the dose is titrated upward, a sense of weakness may occur, and the patient should be prepared for this. If weakness does occur, reduce the dose to an amount more readily tolerated. Other adverse effects include drowsiness that often resolves within a day or two on a static dose and, particularly at higher doses, aggravation of cognitive symptoms. Tizanidine is also given several times a day because of a short half-life, similar to baclofen. The starting dose is 2 mg given at bedtime, which is then titrated to 4 mg to 8 mg given 3 times daily depending on the patient’s response to medication. The major adverse effect of tizanidine is sedation, which often limits use during the day. At higher doses, orthostatic hypotension may rarely occur. Diazepam is an excellent antispasticity agent useful for nocturnal spasticity because of a long half-life. Usually, 2 mg to 4 mg at bedtime is all that is needed, and patients often report, much to their surprise, less fatigue during the day because of improved sleep quality. Some patients will experience persisting spasticity on maximum tolerated doses of oral agents. Intrathecal baclofen (ITB) should be considered for these patients. An intrathecal test dose of 50 mcg (or 100 mcg if 50 mcg was not effective), can determine if this treatment modality is appropriate for a patient. For patients who are implanted with the baclofen pump, the initial dose should be low (eg, ≤25 mcg/day by simple continuous flow), especially for those who are ambulatory. It may take weeks before the optimal dose is achieved. Dosing of ITB can be tailored to a patient’s specific needs (eg, increased dose during the night and decreased dose during the day). To avoid wasting valuable therapeutic resources from physical therapy (PT), it is important to achieve optimal medical management of gait and spasticity symptoms before referring a patient for needed PT. The exception to this is a patient with imminent risk for falls. Programs that have experience with the specific PT needs of patients with MS may have better outcomes and patient satisfaction ratings than those without such experience. The PT specialist is also best equipped to evaluate what gait aids might be necessary (eg, brace, cane, walker) and how to efficiently and safely use them. A prescription for PT should be given simultaneously with a prescription for a gait aid. Any patient with toe drag should be considered for an ankle-foot orthosis (AFO). An AFO can be used constantly or as needed, especially if the patient anticipates prolonged walking (eg, hiking, traveling). Contrary to many patients’ misperception, using a brace does not lead to dependency. When alternatives to walking are needed (manual and motorized wheelchairs), refer patients to reputable vendors for specific individual needs, especially if a custom product is required. Careful consideration of wheelchair design is essential because most insurance requires that a chair be suitable for at least 5 years. The design must therefore include anticipated needs or at least be modifiable. Urinary symptoms are common in patients with MS and, along with bowel and sexual symptoms, affect about 75% of patients. The symptoms can be simply divided into 2 types: failure to store urine (ie, urgency, frequency, nocturia, and incontinence) or failure to empty the bladder (ie, hesitancy, postvoiding sense of fullness, double voiding, and involuntary interruption of the urinary stream while voiding). Patients who have failure to empty their bladders are at risk for UTI. It is generally not possible to accurately predict which type of voiding problem a patient has based on symptoms alone; therefore, all patients with urinary symptoms or history of recurrent UTI should be evaluated with a postvoid residual urine determination. The easiest procedure for determining residual urine is prevoid and postvoid bladder ultrasound. Failure to empty the bladder is defined as a postvoid residual urine >100 mL or >20% of the total bladder capacity before voiding. For patients with high residual urine, intermittent self-catheterization utilizing the clean technique is the treatment of choice. Frequency of catheterization will vary, depending on the residual urine volume. If residual volume is >250 mL, 4 times daily is optimal. For smaller amounts, 1 to 3 times daily may be considered. Patients should also be prescribed urinary antiseptics (eg, cranberry juice or cranberry extracts [D-mannose]), methenamine hippurate, or methenamine mandelate. For some patients, the residual volume will fall in time and the frequency of self-catheterization can be decreased, sometimes to once or twice per month to ensure there is no recurrence of elevated residual urine. Indwelling catheters are a last resort, although they are necessary in patients with high postvoid residual volumes who are not able to self-catheterize. For many, a suprapubic catheter is best because it obviates some of the complications associated with urethral catheters. Patients with catheters should maintain a fluid intake of at least 2 L daily. Indwelling catheters should be changed at least once per month. Bladder stimulators are another option for failure to empty the bladder. However, the changing nature of bladder function over the course of the illness and inability to perform MRI following implantation pose significant limitations and are best reserved when other options are exhausted. For failure-to-store symptoms, defined as a residual urine volume <50 mL, there are many available medications (eg, oxybutynin, tolterodine, imipramine, solifenacin, and mirabegron). Drug selection usually depends on what a patient’s health insurance will cover. Often, several drugs will need to be tried in succession because of widely variable efficacy and tolerability. For patients with nocturia, avoiding liquids after 6:00 pm and, if necessary, taking desmopressin acetate at bedtime as a tablet or nasal spray can be considered. Desmopressin can result in hyponatremia; test serum sodium 2 weeks after starting treatment with desmopressin. For patients with failure-to-store bladder symptoms refractory to oral medications, intravesical Botox is an excellent treatment option. About 30 sites of the detrusor are injected under general anesthesia with fiber optic guidance. Patients tolerate the procedure well. The most common complication immediately following the procedure is urinary tract infection, and about 15% of patients will require intermittent self-catheterization, for a few weeks after treatment. For this reason, patients should be made aware that intermittent self-catheterization may be necessary and should exhibit the necessary skills to do catheterization or have a designated caregiver before botulinum toxin is administered. Constipation is the most common bowel complaint in patients with MS. Stool incontinence is much less common than constipation but is more socially embarrassing. Constipation is often aggravated by inadequate fluid intake because many patients control their urinary symptoms by avoiding liquids. Thus, it is advantageous to treat bladder symptoms first so that it is easier for patients to liberalize fluid intake. If constipation continues after optimal fluid intake, ensuring adequate dietary fiber will help. Encourage patients to use suppositories (eg, glycerin or bisacodyl) or enemas as needed to ensure bowel evacuation at least every 3 days. Sometimes, medications such as linaclotide may be helpful to add. Patients who complain of incontinence should be offered preventive strategies. A simple technique is to train the bowels to evacuate at the same time daily, such as in the morning with caffeine. Other remedies include enemas or suppositories as needed. Ensuring that the bowels are empty before going to work, school, or other social settings will minimize episodes. Diarrhea is not a symptom of MS and requires a search for a medical explanation when it occurs in patients with MS. Sexual dysfunction completes the triad with bladder and bowel symptoms. For men, erectile dysfunction is the most common complaint whereas, for women, anorgasmia is the most common symptom. Erectile dysfunction can be treated successfully with phosphodiesterase inhibitors such as vardenafil. For patients with erectile dysfunction refractory to this class of medication, intracavernosal injection of papaverine, alprostadil, and phentolamine (TriMix) can be considered. For women with sexual dysfunction in MS, achieving a satisfying sensory experience requires inventiveness and a willingness to experiment including the use of stimulators (eg, vibrators). Patients are often open to trying tools that can be found at the local adult shop. Although there is anecdotal evidence that phosphodiesterase inhibitors (eg, sildenafil) can be useful for female patients with anorgasmia, there are limited published data.7 There are also no published data on the use of filibaserin in MS, a drug recently approved for female sexual dysfunction in the general population. Patients are also often relieved to learn that sexual issues may be the result of MS and not psychologic factors. For some, psychologic factors are important contributors that can be related to a damaged body image that an illness like MS may cause. Many patients will need a combined approach of medication, adaptive equipment, and counseling for an optimal outcome. No symptom of MS is more underappreciated than cognitive impairment, yet this is one of the most devastating aspects of MS. The onset is usually insidious and often poorly appreciated by the patient and their family until impairment is advanced. Further, the physician typically spends little time evaluating cognitive symptoms. Deficits in memory (especially working memory) attention, information processing, executive function, and visuospatial skills are among the cognitive symptoms of MS. Language and overall intelligence quotient (IQ) are usually not affected. The commonly used Mini-Mental Status Examinations (MMSE) and the Montreal Cognitive Assessment (MoCA)are both insensitive for the cognitive impairments seen in patients with MS and are unreliable as indicators of cognitive status. Probably the single best bedside predictor of cognitive impairment is the Symbol Digit Modalities Test (SDMT), which can be given as a cognitive screening test. A more comprehensive evaluation, the Minimal Assessment of Cognitive Function in MS (MACFIMS), is better able to capture all the domains that might be affected.8 MACFIMS is a validated test for patients with MS and, for most, can be completed by a psychologist in about 90 minutes. It is also important not to overlook the pseudodementia of depression—the frequent depression that can occur in patients with MS that can masquerade as cognitive impairment. The use of screening tests for depression (eg, the Beck inventory) whenever depression is suspected is encouraged. Although there is progress being made on rehabilitation for cognitive symptoms in patients with MS, the best strategy remains prevention of cognitive decline through use of and attendant changes in disease-modifying treatments, at least for those with relapsing disease. Early detection of cognitive problems followed by prompt changes in disease-modifying treatment might result in better outcomes, but this remains speculative. Strategies to reduce the effects of cognitive symptoms include cognitive enrichment and physical exercise. There is some evidence suggesting that cognitive remediation can be helpful for the cognitive symptoms of MS.9 Medications useful for other dementing illnesses (eg, donepezil or memantine) are generally not effective in treating cognitive symptoms in patients with MS.10 Treatable comorbidities that might affect cognitive performance, such as sleep disorders and depression, should be assessed and managed before patients are sent for cognitive therapy, because these conditions have well-defined and effective strategies. Dysarthria is not uncommon in MS and usually most problematic when it occurs as scanning speech in those with cerebellar involvement and interferes with communication. Speech therapy may be helpful and should include use of alternative and augmentative communication (eg, computer-generated speech) whenever appropriate. Dysphagia is another concerning symptom frequently not considered by clinicians. Ask all patients about choking or coughing in the context of swallowing liquids or solids. Maintain a low threshold to refer for a swallowing evaluation to prevent potentially fatal complications. The modified barium swallow (MBS) test is the best radiographic way to evaluate symptoms and suggest compensatory strategies for those at risk. Pressure sores result from unremitting pressure over bony prominences including the sacrum, ischial tuberosities, greater trochanters, and heels. Occurrence is increased by malnutrition, inappropriate transfer technique (ie, shearing), or moisture (ie, incontinence). The adage, “An ounce of prevention is worth a pound of cure,” can be well applied here. With patient and caregiver education and provision of seating and recumbency surfaces adequate for the circumstances, pressure sores are completely preventable. Identify at-risk patients, and instruct the patient and caregiver on prompt recognition of signs that tissue compromise is imminent. Everyone involved in the care of the patient must be instructed to inspect, at least daily, the areas of potential compromise and identify areas that do not blanch with the application of digital pressure. If an area of compromise is identified by failure of a reddened area over a bony prominence to blanch with digital pressure, changes in positioning to relieve any pressure on the area must be made immediately and until the redness, or sore, is resolved. It is important for patients to select suitable wheelchair cushions when needed. No one type suits all patients. For some, wheelchair design will be necessary because some may have developed scoliosis from truncal weakness, and in that circumstance, only a custom chair will offer the appropriate seating surface. Cushions have a lifespan, and each cushion should be reevaluated at least yearly. Any symptoms of spasticity or fibrous contracture need to be managed and controlled to minimize potential pressure sore development. Flexor spasms increase the risk for heel sores, and fibrous contractures limit available sitting and recumbency positions. Advances in disease-modifying treatment have greatly increased the quality of life for patients with MS. However, it is the clinician’s role to address not only the disease process but also the symptoms. With thoughtful analysis, a clinician can do much to alleviate many of the troublesome symptoms affecting patients’ quality of life and prevent many complications of their illness from occurring or worsening. 1. Rao SM, Leo GJ, Ellington L, et al. Cognitive dysfunction in multiple sclerosis: II: impact on employment and social functioning. Neurology. 1991;41:692-696. 2. Strober LB, Christodoulou C, Benedict RH, et al. Unemployment in multiple sclerosis: the contribution of personality and disease. Mult Scler. 2012;18:647-653. 3. Chiaravalloti ND, Wylie G, Leavitt V, Deluca J. Increased cerebral activation after behavioral treatment for memory deficits in MS. J Neurol. 2012;259:1337-1346. 4. Goodman A, Brown TR, Krupp LB, et al. Sustained release oral fampridine in multiple sclerosis: a randomized, double blind, controlled trial. Lancet. 2009;373:732-738. 5. Goodman A, Brown TR, Krupp LB, et al. A phase 3 trial of extended release oral dalfampridine in multiple sclerosis: a randomised, double-blind, controlled trial. Ann Neurol. 2010;68:494-502. 6. Feinstein A, Rector N, Motl R. Exercising away the blues: can it help multiple sclerosis-related depression? Mult Scler. 2013;19:1815-1819. 7. Brown DA, Kyle JA, Ferrill MJ. Assessing the clinical efficacy of sildenafil for the treatment of female sexual dysfunction. Ann Pharmacother. 2009;43:1275-1283. 8. Strober L, Englert J, Munschauer F, et al. Sensitivity of conventional memory tests in multiple sclerosis: comparing the Rao Brief Repeatable Neuropsycological Battery and the MACFIMS. Mult Scler. 2009;15:1077-1084. 9. Sandroff BM, Pilutti LA, Benedict RH, Motl RW. Association between physical fitness and cognitive function in MS: does disability status matter? Neurorehabil Neurol Repair. 2015;29:214-223. 10.Krupp LB, Christodoulou C, Melville P, et al. Multicenter randomized clinical trial of donepezil for memory impairment in multiple sclerosis. Neurology. 2011;76:1500-157.